Lynden Williams is the man behind Neighborhood Brains, as well as a new music project known as 1991. Williams’ latest music showcase, Neighborhood Brains and Squarewave Sound present Magic Sword at Super Top Secret, was a night full of “firsts.” The showcase marked the first time 1991 had played live, the first time STS (which is a full-service ad agency) held an official music event at their venue and the first time mysterious retro-futurist group, Magic Sword, made an appearance in SLC. What I initially viewed as a cool D.I.Y. concert, put on by a local music fanatic soon transformed into a large-scale event that became a unique and visceral, experience for many. If you’ve ever been to STS, then you know that their space, although stylish, is somewhat limited. What I didn’t realize is how transformative the space actually is. The front wall that’s painted black on the outside, and features the STS logo, is actually a 30-foot high garage door that fully opened on the night of the show. The mini-ramp towards the back of STS, which typically faced a sea of desks with computers, was covered in stage equipment and the work desks had been completely removed. STS actually looked like a live music venue, and a very cool one at that. Quilts kicked off the night with a nice set of dance music, which unfortunately became background music, as people mingled inside and outside of the venue, as well as across the street at a food truck known as Saturday’s Waffle. It was a happening night. A noise concert was taking place next door at Diabolical Records, and many were patiently awaiting 1991’s debut set and the madness that would follow. There also seemed to be a surprisingly large amount of people in attendance working as stage assistants. It wouldn’t be long before I found out why. 1991’s set was a true delight. 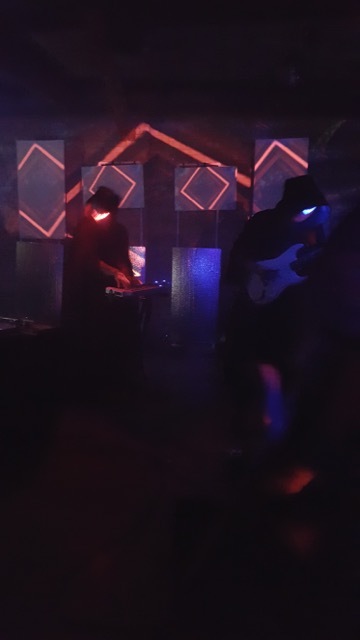 It was the first time I had ever had the opportunity to hear music related to the vaporwave genre played in a live setting. Vaporwave is basically music inspired by computer sounds and corporate jingles from the 90s. Think of the Windows 95 start up sound, which was crafted by Brian Eno, looped, slowed down and paired with drums. It’s a fascinating genre that’s been on the rise for the past five years or so, and 1991 are somewhere in that realm. Currently, they’re without a vocalist, but they do wonders with only a keyboard and guitar. That equation of instruments is what made Youth Lagoon’s debut album a giant dream-pop success, and there were a few moments during 1991’s set that took me back to that special album. Youth Lagoon is from Boise, which is also where Street Fever and Magic Sword call home. Williams met both of the former bands while playing at Boise’s Treefort Music Festival. There’s something special happening in Boise’s music scene, and we’re lucky to have Williams clueing us in. As 1991’s horn samples and mellow grooves transported me to a cyberworld full of color and synthetic luxuries—I could only think of how stoked I was on the band’s future. Street Fever followed and came with an attitude, stage set-up and presence that was worlds apart from 1991’s. In turn, he put on the most dynamic electronic performance that I’ve ever seen. He walked out in all black, wearing a headpiece that looked like something between the Predator’s head and a Slipknot mask. It was downright spooky. He then instantly worked the crowd into a frenzy with throbbing electro beats and poles of flashing light surrounding him. Not long into his set, a blonde woman in black velvet with black face paint joined him. She took the microphone and began slowly chanting until she would scream and stomp around the stage. She also spoke methodically, in French, throughout one of the songs, which sounded like something you might hear on the soundtrack of an ominous neo-noir movie. The whole set was full of dancing bodies and phones pointed toward the stage, recording a seriously raw performance. At one point, Street Fever were also accompanied by a male vocalist who covered his face with a bandana and climbed all over the stage as he screamed into the microphone. As the set came to an end, Street Fever set a single beat to loop and stepped off of the stage. A stage assistant handed him a steel bat, and Street Fever proceeded to beat a keyboard to pieces with it. I stood at the top of the mini-ramp and watched an audience in awe as they dodged pieces of flying plastic. Then, it was all over and Street Fever confidently walked away as the crowd raucously applauded. Thirty minutes later, the night’s main event approached the stage shrouded, literally, in mystery. No part of the duo’s bodies were showing. 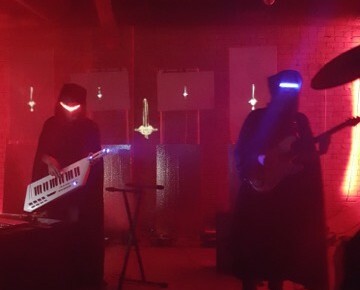 They wore cloaks with hoods and strange sunglasses that were basically bars of light. Magic Sword, as they’re called, love bringing the crowd into their world of fantasy, and there were fans with swords, bought at the merch table, lighting up the crowd as they pointed towards the sky. Magic Sword sounds like a John Carpenter soundtrack with glimmers of hope that eventually become beacons of light, as synthesized progressions transcend toward the heavens. Theirs is a musical power that wraps you in until you feel like you’re on top of the world as an avenger of good. After all, that is Magic Sword’s motto: When the magic sword appears, good will always prevail. Magic Sword definitely left the crowd feeling uplifted that night, and I’m sure most people, as I did, left STS dreaming of films like Blade Runner, and what we could do next to keep our retro-futurist highs brimming for as long as possible. 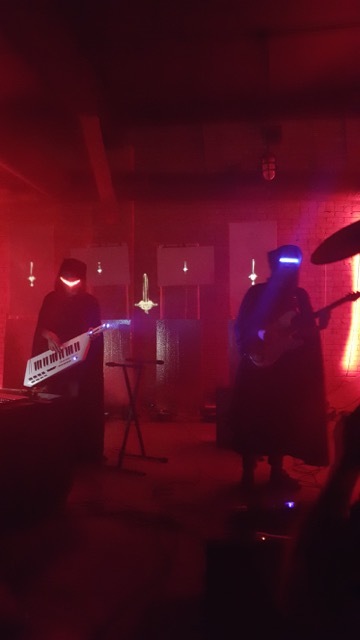 As I shared a picture from Magic Sword’s set with a friend, he jokingly responded, “Dude, how did you get Darth Sidious to do a set?” I responded by saying, check out the music and you’ll see there’s no way they could play in regular clothes and translate the feeling. It’s hyper-reality stuff.